Location: Jones Lake Reservoir (aka Wahleach Lake) lies approximately 25 km. (15.5 mi.) southwest of the town of Hope, British Columbia. Turn south off BC Highway #1 at the community of Laidlaw. Final access is 9 kms. (5.6 mi.) of steep gravel road. The Jones Lake Forest Service Road is car accessible, however caution must be taken as it is an active logging road Monday through Friday. 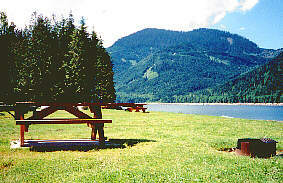 Resorts & Campsites: No resorts are present at the Wahleach Lake (Jones Lake), however there is a beautiful BC Hydro Recreation site which has boat launching, a picnic/day use area, approximately 20 campsites, and hiking trails. Fishing Report: Fair to good catch rate for rainbows to 1+ lbs. Kokanee up to 2+ lbs. are also found in the lake, and fishing for these can be excellent at times. Trolling with small lures such as wedding bands seems to be the most productive method used in Jones Lake, however fly fishermen have also reported good success. History: Upon arrival at the parking lot of the recreational site you will notice a sign along with photos and diagrams that tells you the story of BC Hydro's Jones Lake project. It reads: "The Jones Lake Reservoir and the associated Wahleach Generation Station next to the Fraser River, show how geography and climatic conditions play a major part in the development of electric power in British Columbia. The availability of large volumes of water combined with the potential for creating a high elevation drop determines the locations for Hydro-electric sites. When the Wahleach Project was completed in 1952, the elevation drop of the water was higher than any electrical facility in Canada. The surface of the resevoir is over 600 meters (1968 ft.) above the Fraser River. Usually stream flows or runoff from snow melt, is low in the winter when maximum electrical production is required. Conversely, when runoff is high in the spring and/or summer electrical demand is reduced. Storage reservoirs, such as Jones Lake, balance outflows with energy demand using stored water to produce electricity throughout the year. The Wahleach Project was officially opened for power production on 4 December 1952. When completed, the Project produced 13.5 % of the electric power required by the British Columbia Electric Company, a predecessor of BC Hydro. Although the Wahleach Generating Station now supplies less than 1% of the electric requirements of BC Hydro, it is nevertheless an important link in the production of electric power close to the major load center in the Lower Mainland. A detailed engineering investigation by BC Hydro in the 1980's showed several modifications were required to enhance the safety of the dam and associated works. Improvements were undertaken within the tunnel, at the spillway and at the dam between 1990 and 1994. In conjunction with this work BC Hydro completed an extensive debris clearing operation within the Jones Lake Reservoir. The Recreation Area associated with the Jones Lake Reservoir was developed to ensure the public can enjoy the recreational aspects of the reservoir in a safe environment. For your own safety you must obey all posted hazard and warning signs as there is an extreme danger in and around operating Hydro-electric facilities." Jones Lake is a beautiful and interesting recreation site (coupled with, of course, some excellent fishing, hiking and family camping experiences) and is well worth a stopover while visiting the Lower Mainland of British Columbia.